Many places, especially popular cities like Barcelona, Copenhagen, Berlin etc., are now entering a ‘second phase’ in their branding and marketing. They have already established their brands, been successful and are now wanting to move the narrative and story of the place further. Typically, pressure comes from newly elected politicians, eager to build their legacy by changing brand initiatives and visual identity components, such as logos. Unlike the usually more short-term focused and campaign-driven work of their marketing colleagues, place brand developers and managers deal with a task which requires long-term commitment and continuity. But how to resist these pressures, and at the same time maintain momentum of a place brand, once it is established? We asked our expert panel – here’s what they suggest. Authenticity: Jordi de San Eugenio Vela points out that it is important to respect and reinforce the genuine identity of the branded place. Teemu Moilanen also stresses the importance of staying true to the core identity of the brand, illustrating this with examples of great commercial brands that manage to stay relevant by sticking with their core values. Sebastian Zenker compares place branding to a marathon, where the key requirements are patience and perseverance. In this sense, quick and frequent changes can only harm the brand and lead to waste of money. Similarly, Ed Burghard sees a brand as a promise, creating an expectation of an experience. Therefore, it is down to elected officials to be trained on branding and to ensure that this promised experience remains authentic and competitive over time. Although it is now well established that places cannot be reduced to a simple tagline or a logo, it is no easy task to resist the urge to based a whole city branding strategy on a new, revised or updated logo, Heather Skinner points out – especially when being pressured to do so by politicians. She further explains that the requirement of brands to be stable is often in conflict with political parties facing regular re-elections. New regimes, she adds, often see a need for new and revitalized brands. Joao Freire [Grounded Brands] reminds us that a logo is a graphic representation of a brand’s value proposition. Consequently, changing a logo implies a revision of the entire place brand strategy: a costly and not always justified process. In the eyes of José Pablo Arango, the discussion should not be about whether to change the logo or when, but rather transcend into whether the logo really contributes to the narrative and the identity of the place. Taking this thought one step further, Gary Warnaby notes that the complexity of places might mean that a simplistic brand position is too reductionist and fails to capture the essence of cities, regions or countries, especially as perceptions of the place are subject to a wide variety of factors. Jeremy Tamanini concurs, stating that branding professionals have struggled over the years to explain to decision makers that a place logo is but one facet of an overall place identity strategy. He fears that pushes for a new logo or tagline by city leaders as an answer to promote greater place attractiveness can only lead to confrontation. Instead, he suggests to focus on and measure the factors that contribute most to the place’s attractiveness. Quite a few of our panelists in their answers highlighted the need for tangible measurements and of key factors. Günter Soydanbay [Soydanbay Consulting] quotes one of world’s leading consultants in organizational behavior and systematic change, Meg Wheatley, saying: “What you pay attention to becomes real”. He insists on the importance of arming politicians and bureaucrats with proofs regarding the tangible progress of branding initiatives. José Filipe Torres [Bloom Consulting] states that measuring success makes place branding more tangible. No doubt, monitoring key factors linked to place attractiveness makes it easier to undertake effective adjustments for the future. Joao Freire suggests to monitor and evaluate the strengths and weaknesses (or ‘winners’ and ‘potential losers’) of a place brand strategy, and to set up tools for managing different stakeholders in order to achieve a balance between these opposites. We recently asked our expert panel about the keys to successful place brand management. There was a significant focus on the role of residents. This time is no different. Which groups have not been privileged by the initial strategies and should be part of the next move? How can we further enhance the place brand, to increase the social impact and benefits for the community? The importance of integrating branding processes into wider community projects is also seen by Can Seng Ooi and Ed Burghard. Can Seng Ooi explains that the process of branding is far from static. In his view, debates and conversations can provide a healthy platform to reflect on the community’s identity. Once again, Günter Soydanbay illustrates this point with quoting Wheatley, stating: “There is no power for change greater than a community discovering what it cares about”. Whatever the problem, the community is the answer, says Soydanbay. Instead of dictating a solution, ‘second phase’ cities should guide their communities to come up with theirs. Jeannette Hanna [Trajectory] expands on this by focusing on the role of “champions”, engaging local businesses and institutions to become advocates for their place, promoting neighborhoods and local goods. However, there is no guarantee that community involvement will be the best way forward. Can Seng Ooi suggests that, while consultation is always important, sometimes this engagement process generates more conflicts, resulting in brand propositions representing only the lowest common denominator. These are the situations where a stronger leadership with a strategy and a vision would be beneficial. 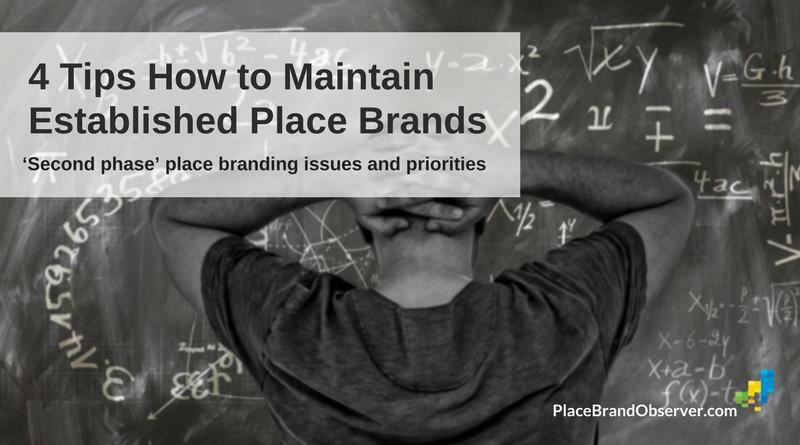 In other words, branding priorities and approaches need to be adjusted to the specifics of the place in question. Does a brand ‘freeze’ the image of a place while the place changes? What weight should be given to the past and the future? Should brand management and leadership be consultative of forceful? Referring to the first question, Jaume Marín explains that it is important for places to link additions to a destination’s offer to the umbrella brand, and to have a common objective and way to explain this connection through storytelling. Jeremy Tamanini observes that many European cities tend to emphasize a ‘safe’ marriage of history and present day, with architecture, culture, arts and food on one side, and green spaces, tolerance, entrepreneurship and the like on the other. He sees this as a somewhat tired solution, proposing to look behind the most recognized elements and finding new, exciting routes that can reflect cultural diversity even better. Joao Freire, emphasizes the importance of guaranteeing the quality of life of the local people, making sure they are not forced to leave their neighborhoods to make room for tourists or short-term residents. Therefore, he finds it important to avoid city development being driven and dominated by the tourism industry and real estate companies. José Pablo Arango sees achieving the sustainability of branding projects in the long-term as the most important factor: turning a place branding initiative into public policy, securing its future by giving it a budget and by embedding it within a place’s institutional framework. Enjoyed those tips by our expert panel on how to maintain established place brands, challenges and priorities? Spread the word!